If you cant make the conference, at least buy the book. 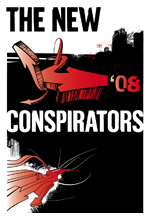 Its called The New Conspirators: Creating the Future One Mustard Seed at a Time. Tom sent me the manuscript last year and I was really impressed with it. Tom and Christine Sine are possibly the most connected people I know to the wider emerging church scene AND the historic Jesus movement of the 70's in which they also had a part. It was the Sines that connected me with key leaders around the world including New Zealanders like Mark Pierson (who is speaking at the conference this weekend) and Emergent Kiwi Steve Taylor. They are always ahead of the game. Interesting answers are coming in to Kester's question. Kester Brewin asks this question on his blog, and also inside a group chat that i am involved in. Larry Norman, the "father of Christian rock" passed away yesterday. His friend and colleague Steve Camp has the skinny, and a song dedicated to him called "If I was a singer". Good post on AnglicanFuture on micro-credit enterprises overseas. I was recently pointing to Henry Venn's suggestion of banks for Sierra Leone in the 1850's as a viable mission strategy for today. Its encouraging to see these projects around the world. Believe it or not, we are thinking through a micro-credit system here in Scotland for new businesses because most government funding is only for larger and more established enterprises. The conversation at Jesus Creed on C. Michael Patton's chart on orthodoxy and the emerging church is winding to a conclusionary pause and Patton has added more thoughts behind his attempt to map out the emerging church on the orthodoxy scale. Nah. I don't feel that time-traveling to the 1920's dichotomy of fundamental/liberal to see which side we would land is the best way to reconnect a robust trust in the Scripture with a obedient commitment to social justice as outlined by the mandate of Jesus. I believe the story of the Bible is connected to the event - or in other words, those miracles of Jesus really happened - and so I am not a liberal. But I am also committed to the whole gospel as Jesus described it and that inclusion of justice and social transformation makes me appear suspect by fundamentalists. I prefer not to use the scale at all because its not helpful. I don't like it Sorry. I appreciate the effort of C. Michael Patton but these charts are neither helpful nor meaningful to me. I wondered why those particular authors were chosen to represent the emerging churches (and why authors and not network or emerging church ministry leaders?) and then I noticed that the 'emerging' and 'emergent were over to the side of Orthodox Christianity, rather than the center. Shoot. What are we doing if it is not moving towards orthodoxy and orthopraxy? The emerging church movement, in my opinion, at least in my corner of the room, is at least an attempt to realign God's mission and the mission of the church in our generation with the way of Jesus and his apostles in a manner that resonates historically and theologically with what the catholic church has traditionally viewed as "orthodox". Patton has some good thoughts on what orthodoxy means, but I don't think he sees emerging church movement nudging the church towards orthodoxy in the way I do. His recent posts on his view on the emerging church [which says nothing about the missiological thinking behind the movement and seems to avoid the eschatological issues that are currently being raised by McLaren, Wright and Tony Jones] show that he sees the emerging church movement very differently than I do. I am just finishing off the book Evangelicals and Tradition: The Formative Influences of the Early Church(2005) by Baptist theologian D.H. Williams. Really good book and highly recommended for those wishing to revisit the early church and explore the relationship between the Scriptures and tradition. Williams argues that, according to the early fathers of the church, the Bible is not a one-dimensional book that gives way easily to detached scientific hermeneutical method, but rather is a multi-layered revelation. He warns against the dangers of a Sola Scriptura divorced from the foundational tradition of the church (Nuda Scriptura) and suggests a more mystical nature of Scripture that gives itself to the pure in heart in the context of worship and community. This reminded me of the late missiologist Paul Hiebert's doxological or "tropological" theology that I have discussed here under Icons and the Possibility of a Tropological Theology. Maybe. Maybe not. 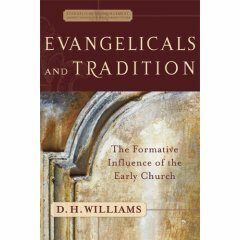 If you haven't read any Williams, then his earlier book, Retrieving the Tradition and Renewing Evangelicalism: A Primer for Suspicious Protestants is probably a better book. It is more edgy, prophetically cutting, and a more appropriate place for Protestants to start. 'Evangelicals and Tradition' brings out a few issues readers had with the earlier book but spends more time dealing with the relationship between Scripture and tradition and explores a hermeneutic that integrates mystery and allegory as well as the literal meanings on the surface. It feels more like a Seminary textbook that his earlier book. The other book to buy as a companion to Retrieving the Tradition and one that links William's ressourcement challenge with the current emerging church movement is Remembering Our Future: Explorations in Deep Church, edited by Andrew Walker and Luke Bretherton. This book, like Williams' Evangelicals and Tradition, are part of the same series called Deep Church, a term coined by C.S. Lewis in the 1950's. Stuff with us this week. - Debbie did a social enterprise course called "Sense and Sustainability" and I took a 3 day small business course on how to start up a business in Scotland. On Thursday, Debbie and I were in different rooms at the same building. - Our cooperative had its first almost-official meeting last Sunday and we appointed Directors and decided on how this thing would run. - Jessica Stricker is here for a few weeks from Austin . . and London. - Electricians have reconnected the Sorting Room to the main grid and now, after a decade of no electricity, the lights turn on and the space is wired for action. - Furniture action on Thursday and Jessica went for us. I bought two old stove for £1 each. Very cool. One from the 60's and the other from the 1940's. I also bought some old peat digging tools so we can start digging up our own peat from the ground for heating. - Kids are well. Samuel did really well in his pre-lim exams. - Our runaway goose named Christmas Dinner is still happily swimming around the harbour and getting fed by locals. - I play badminton on Thursday nights on a pretty regular basis now. - Debbie and I do Orcadian dancing on Tuesday nights and we almost always the youngest people there. I am taking a business course for a few days. This will help me figure out the legalities of starting businesses in Scotland. 14 of us in our class and its not too painful.